La Parisienne bookseller along the Seine. This was one of my first shots on the morning after we arrived. She had a large stand of books but she also played with painting while she waited for customers. I especially like The Louvre behind her across the river as if it were her background sketch. This may be my favorite character in all of Paris. The woman with her dog and her man, who’s on the sidewalk, drawing. Or something. 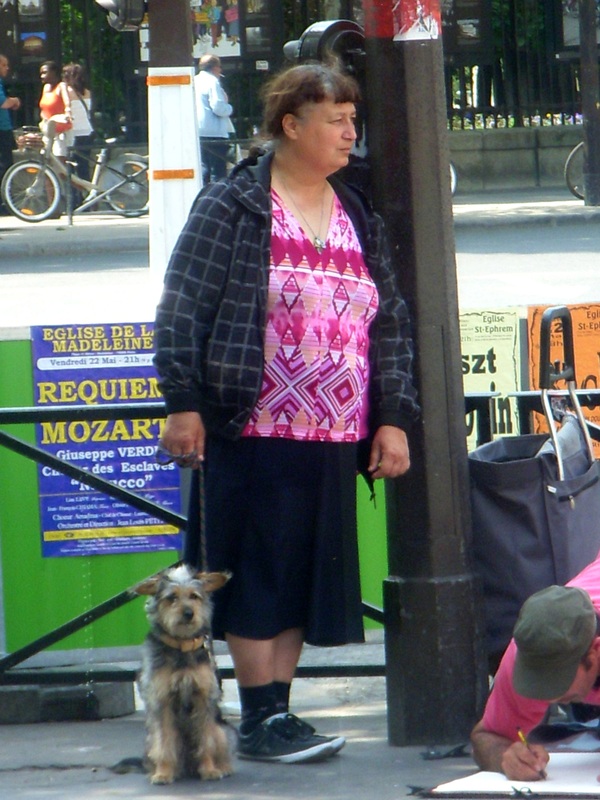 Sometimes she and the dog watched passing Paris and sometimes they just watched him. Priceless. 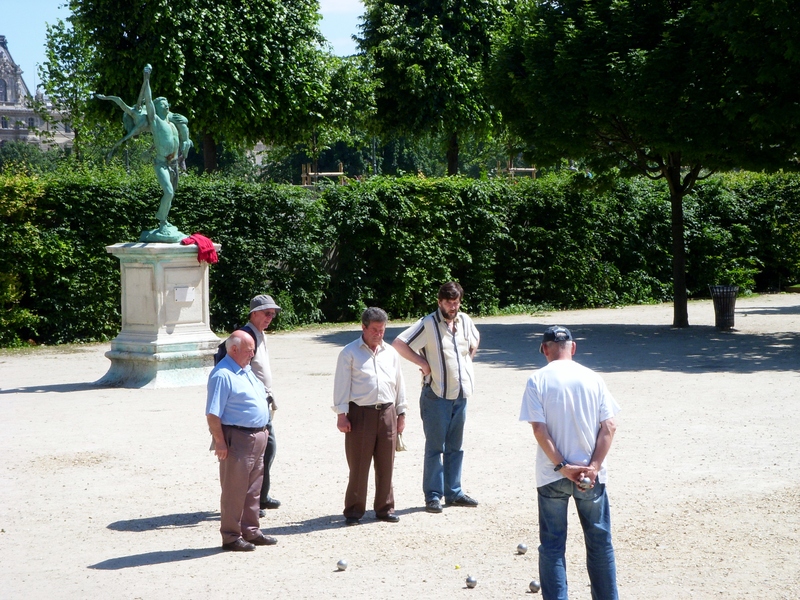 Bocci Ball players. I have no idea what the rules of this game are, but they spent considerable time standing and staring at the balls. I especially liked the splash of red sweater on the statue. An afternoon nap in the Luxembourg Gardens. I loved the bare elbow pointing to bare knee. 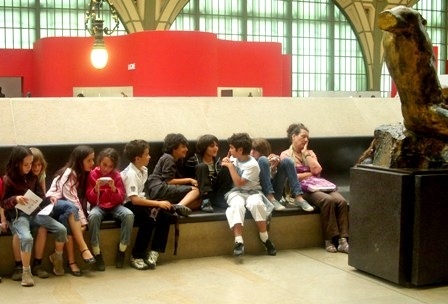 Students taking a break at the Jeu de Paume Museum. 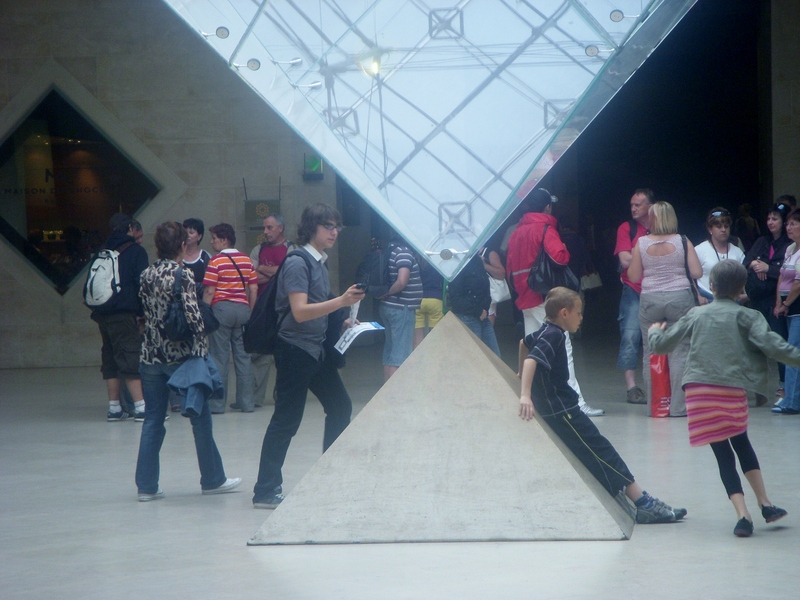 Students wiggling; teacher taking a nap; weird statue doing what weird statues do in the Impressionist world.
. Young man at the Louvre, holding up the inverted glass pyramid all by himself. 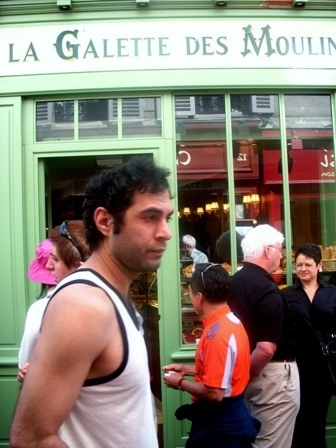 Very famous La Galette des Moulin bakery on Montmartre. Not so famous people walking by. What makes this interesting is the back of my husband’s head and shoulder reflected in the window corner. 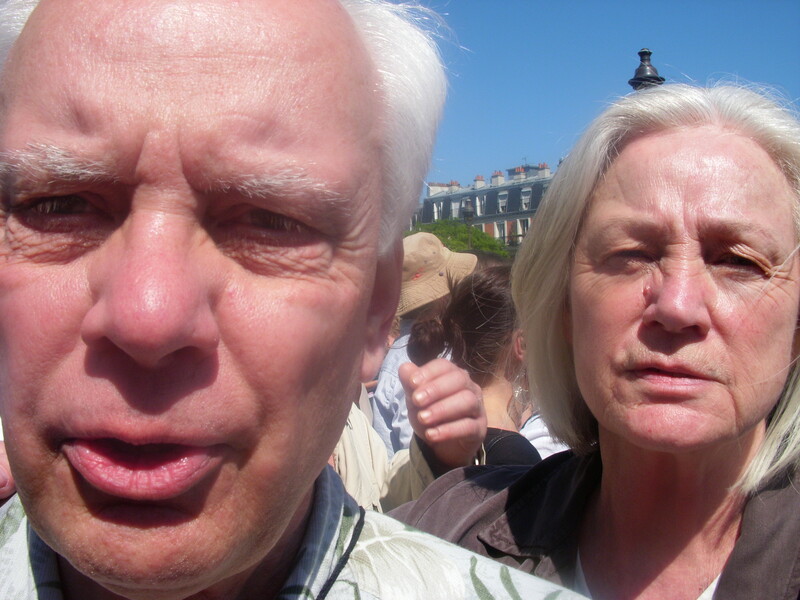 And the weirdest characters of all…Cliff and Janet trying to take a selfie. That’s what you get for giving grandparents a camera. Yes, lovely photos, and I really appreciate hearing what YOU liked in each, drawing my eyes through your eyes! You know, it pleases me to re-see Paris too. It’s been, let’s see, three years since we visited, I guess. But the images make it now again. The photo of the napping teacher and wriggly students is my favorite, although they all communicte very clearly the charm of the city and the human realities of life: like that woman stretched out on the bench. It’s hard, absorbing all that life! Thank you. I was so amused and UNDERSTANDING of the napping teacher. Whew. Students are always a lot of work, regardless of the age. I absolutely adore cities and seeing the life that’s lived in those environs. LOL! Loved the pictures..especially the last one!!! Thanks, Rebecca. I’m always amused at how well my grandson’s wife takes selfies and how unwell we do! Or maybe it’s a generational thing!! Beautiful photos! Thanks for the brief trip to Paris! Bocci Ball is delightful, though I can’t remember the rules. Maybe that’s why they were standing around staring at the balls. Love the photo in front of the bakery with Cliff’s reflection clearly visible. Selfies require long, steady arms, and take practice–keep trying, and just smile! Ah, hadn’t considered that may have been staring at the balls! I like that. Thanks, Susan! I may have to capture that line in future thoughts about this photo. These are so wonderful! Each photo tells a story. I especially love the selfie. You can tell how hard you were both trying to get it right.